Mexican Stuffed Sweet Potatoes! For all you taco lovers, this is something new, different and healthy! Last week as I was eating my buffalo chicken stuffed sweet potatoes (which I absolutely LOVE), I thought to myself, what else could I stuff into sweet potatoes?? Immediately I thought about all the taco obsessed people in the world and boom! This recipe was created! 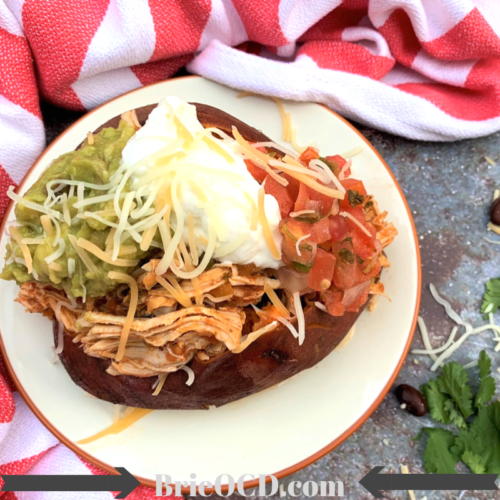 I combined my Cilantro Lime Chicken Recipe and Baked Sweet potato recipe to make a new and exciting Mexican dish. Per serving this recipe has 383 calories, 6g fat, 39g carbs and 40g protein. Since the carb content is a little higher, this is a great meal to have post workout. It is filling and will also refuel your body with all the energy you just expended. It is gluten-free and did I mention delicious? 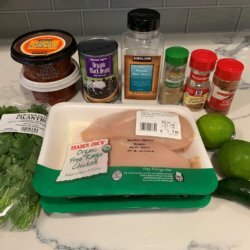 My original cilantro lime chicken recipe is served with a few different toppings and over rice, if you aren’t the biggest fan of sweet potatoes. I still remember my auntie Anne eating a sweet potato saying “you don’t know what you’re missing”, as I looked at her in disgust LOL. She was right! 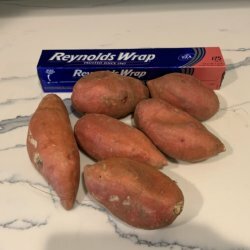 You can make this recipe so many different ways however this time I decided to bake my sweet potatoes instead of putting them into the instant pot. Sometimes I think it is just easier to throw them in the oven and know that they will come out perfect every time. 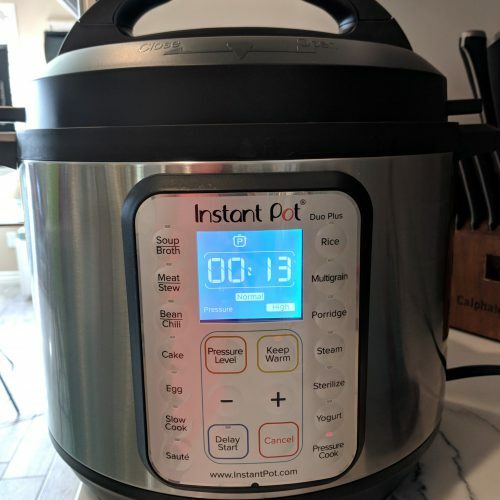 However if you prefer to use the instant pot for the entire recipe you can do that too! 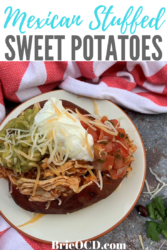 Click here for sweet potatoes in the Instant Pot recipe. Either way this recipe is sure to be a hit! There are also options for the chicken! I made the chicken in the instant pot however if you don’t own one you can easily make it in the crock-pot. Simply follow all of the instructions below and instead of throwing everything into the instant pot, just throw it in the crock-pot on low for 8 hours or on high for 4 hours. You can literally garnish these sweet potatoes with any topping you like! I chose pico de gallo, guacamole, greek yogurt and lite shredded cheese. 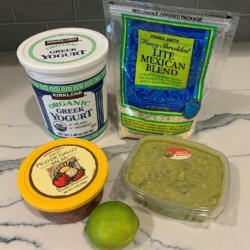 If you want to keep your fat content down, just get rid of the guacamole (however, it is a healthy fat!). You can also choose to eat this in the potato skin or out of the skin and then top with the chicken, guac, greek yogurt and cheese. My husband likes the naked technique so that he can just slop everything into a bowl and devour! If you like this recipe you should try others like this one by clicking on the following: Buffalo Chicken Stuffed Sweet potatoes, Mexican Tostadas, 10 Minute Turkey Tacos, Tropical Shrimp Ceviche, Shrimp & Pineapple Tacos! Preheat oven to 450 degrees. wash sweet potatoes and poke holes randomly on potatoes. 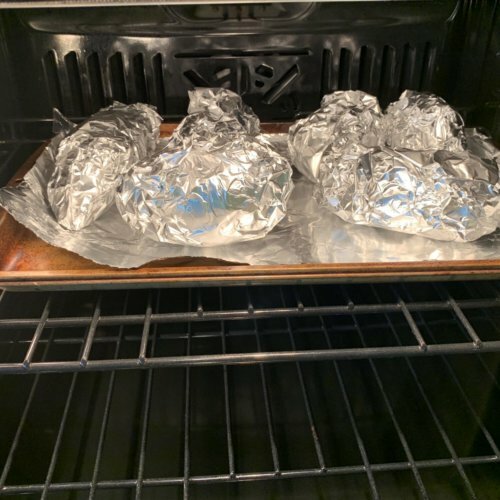 wrap in tin foil and bake and for 45min-1hr (depending on size) or until a knife slices through. 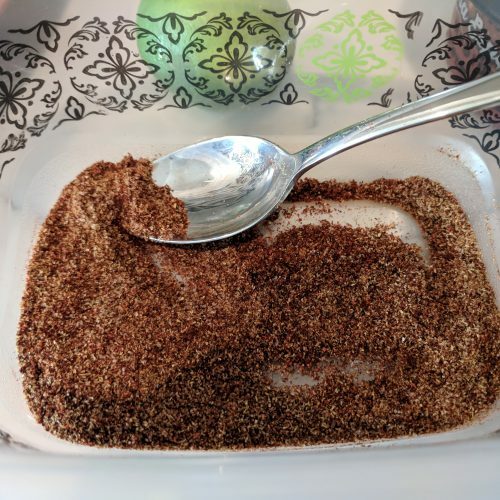 in a small mixing bowl or tupperware combine chili powder, cumin, coriander and salt. place chicken breasts in Instant Pot and season both sides with spices. 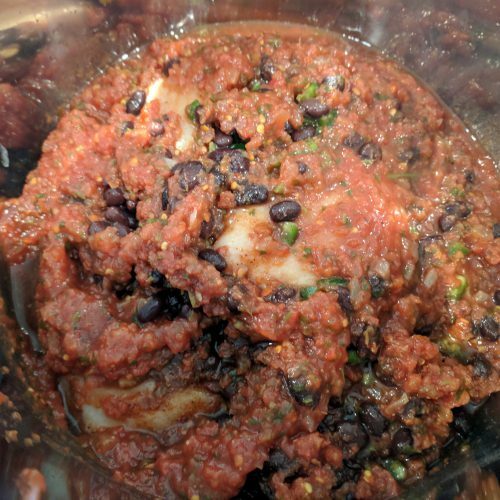 cover instant pot and make sure vent is sealed. Set IP on manual pressure setting on high for 13 minutes. when done, use quick release method (press cancel and immediately release steam). 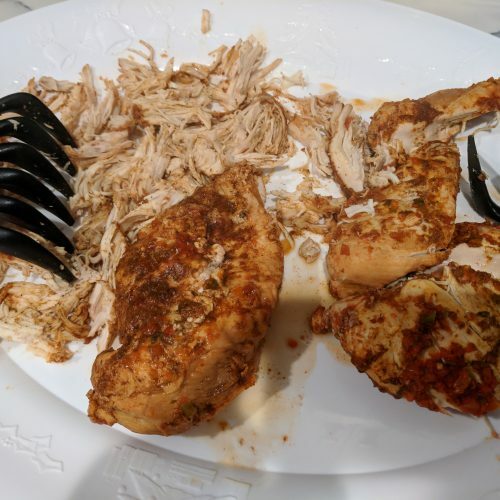 remove chicken from pot and shred with claws or two forks. 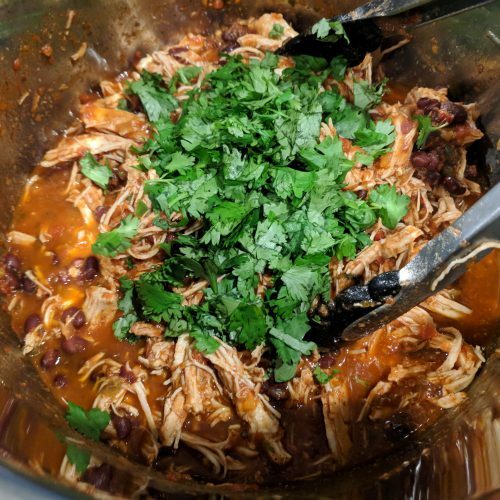 put shredded chicken back into pot and add cilantro and juice of 1 lime. stir. slice sweet potato down middle and use a fork to loosen the inside of sweet potato. top with cilantro chicken. then add guacamole, pico de gallo, greek yogurt and shredded cheese. Enjoy!